First lines: The world is a clock winding down. I hear it in the wind's icy fingers scratching against the window. I smell it in the mildewed carpeting and the rotting wallpaper of the old hotel. And I feel it in Teacup's chest as she sleeps. The hammering of her heart, the rhythm of her breath, warm in the freezing air, the clock winding down. Synopsis: How do you rid the Earth of seven billion humans? Rid the humans of their humanity. Surviving the first four waves was nearly impossible. Now Cassie Sullivan finds herself in a new world, a world in which the fundamental trust that binds us together is gone. As the 5th Wave rolls across the landscape, Cassie, Ben, and Ringer are forced to confront the Others’ ultimate goal: the extermination of the human race. 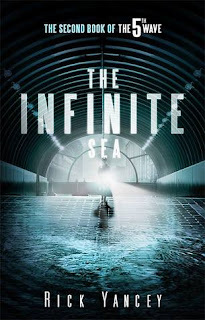 The Infinite Sea is the 2nd book in the young adult, apocalyptic series - 5th Wave - in which aliens are trying to wipe out all humanity on earth. It picks up right where the first book ended with the kids having escaped Camp Haven, hiding out in an old hotel. Ringer is leaving to go in search of other survivors, to find a safe place for all of them. They are all aware she might not make it back, but are willing to take the risk. From there the story is non stop action, even though some of the characters remain hunkered down in the hotel, fighting psychological as well as physical forces, while Ringer battles for her mind and humanity against Camp Haven's commander, Vosch. I'm looking forward to reading the third and final book in the series - The Last Star.